The Fellowship was fortunate enough to obtain a copy of CONAN RED SONJA #1 from Dark Horse Comics and Dynamite Entertainment. Gail Simone and Jim Zub write, Dan Panosian draws and Dave Stewart colors. Conan and Red Sonja haven’t always been famous. This story is from those times, back when they survived by thievery if that’s what was needed. They have been contracted separately to steal the same item. In a hurry, they choose to work together, and in doing so they stop something terrible from starting. Or did they? With both Conan and Red Sonja seeing an upsurge in popularity recently, it was inevitable that the two should meet (even with different publishers). And if you’re going to do it, it can’t hurt to get some of the hottest hands in the business. Simone has been knocking Sonja out of the park, and Zub has become a fantasy powerhouse. And Panosian has an impressive body of work, as does Stewart. The first issue delivers on all of that promise, too, with a save-the-world story and beautiful artwork. I still contend that fantasy will be the next breakthrough in comics, and this title could easily be the linchpin of that breakthrough. Pick it up quickly, before it sells out. 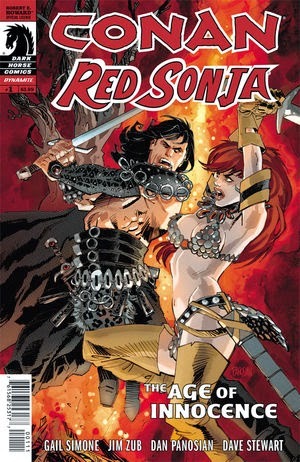 CONAN RED SONJA #1 is available now at your FLCS or at darkhorse.com.